Yesterday was the last day of summer and for the last few weeks I have been desperately clinging to each summer day with its sunshine, light breeze, endless BBQ’s and outdoor play dates. But alas, Autumn has crept in and with it comes crisp evenings, bonfires, apple picking and HALLOWEEN! Okay, so the decorations have been up in stores for months now but I refused to buy into it so early. After all, I was hanging on to each warm day while I could. But I have been bitten by the Halloween bug and therefore began thinking of ways to decorate my home. Our new home has no porch but a stoop. This has me looking for new ways to decorate with sturdy items that hold up to rain and all the wild outdoors have to offer. Not gonna lie, I miss my porch! 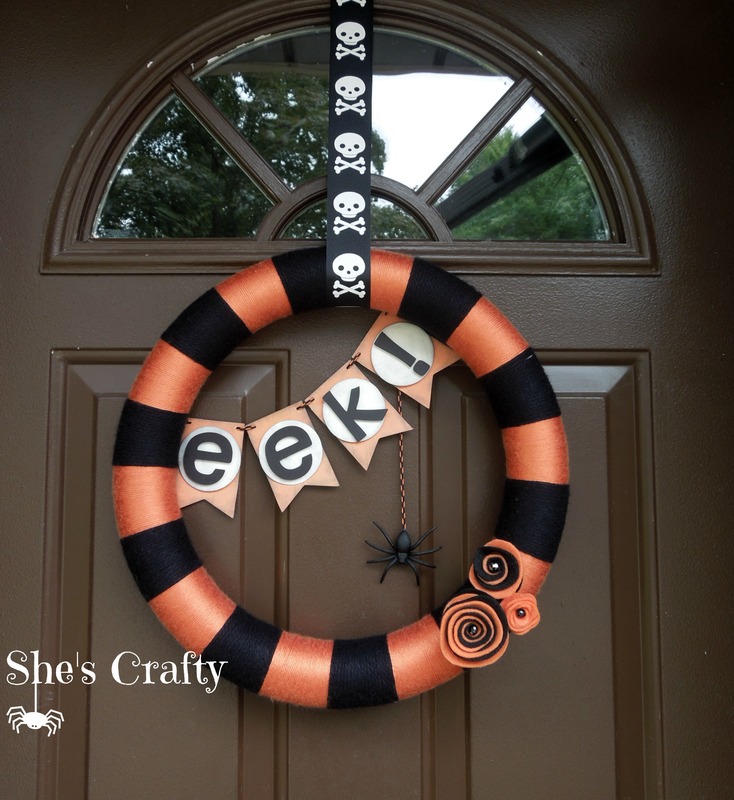 But I have taken the challenge and decided to update my door with a new wreath or item each month. And guess what? I made something awesome! It began with a gift for my “crafty boo” Deanna. 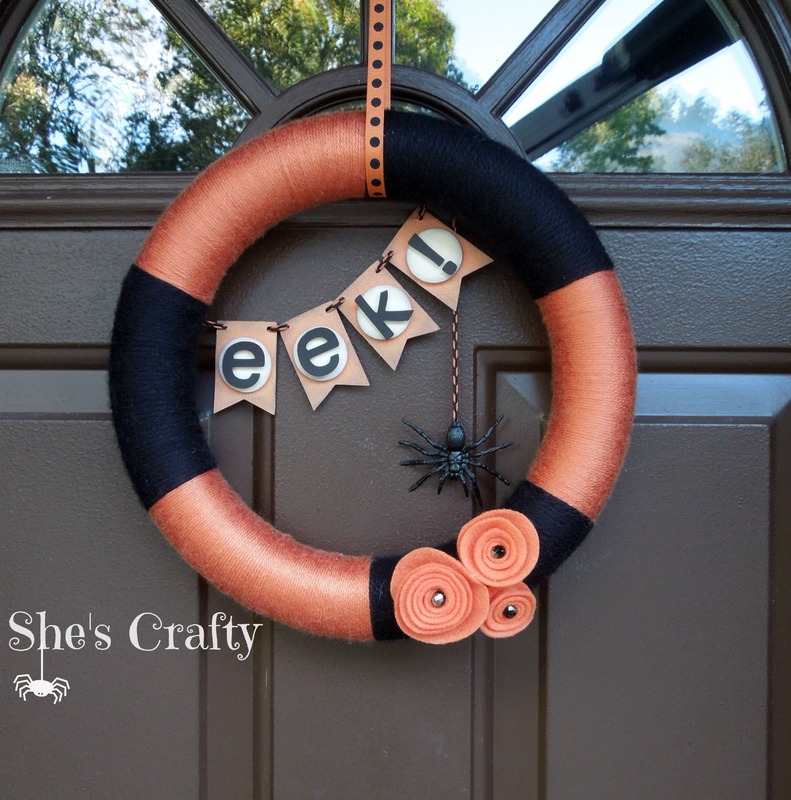 She was married on Halloween and I thought to make her a nice Samhain gift that was fun and bright. Once I finished her gift, I knew I had to make myself one! And well…here it is. I love the details of the banner. I weathered the edges with ink to age them up a bit and decided that the orange and black braided twine that I picked up for .29 cents on clearance this summer was perfect for the spider’s “web” as he spun down the wreath. The felt flowers are so easy to make. 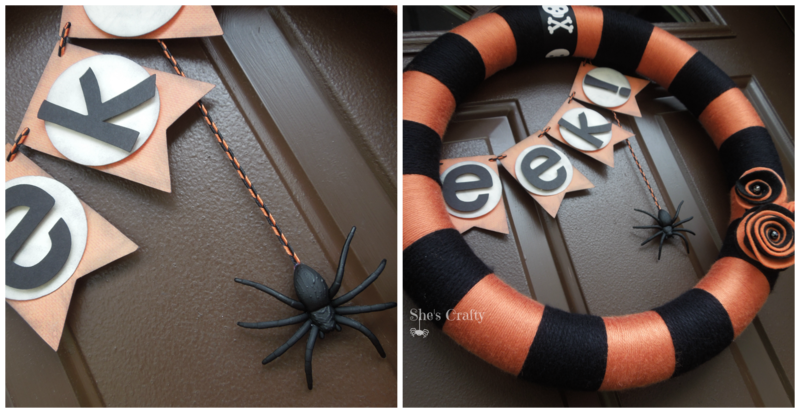 I added magnets to the back of the wreath and spider to keep them from bouncing around as the door was opened and shut. This is an awesome trick for any door decor you may be hanging on your steel exterior door. Here’s a sneak peek at my stoop. I think once we hit the pumpkin patch I will have more to show all of you. I like to keep things simple. With 3 kids I feel like I have the attention span of a doorknob so I tend to over think things and then lose my train of thought as I go. So it is best for a gal like to me just pick a few things and lay them out and see what I like. These planters were left from the former owner and I decided that a few coats of Rustoleum spray paint in hammered Bronze that I already had in the basement would update them perfectly and helloooooo: it’s FREE! These planters were foam like and orange/terracotta . Now they look like metal with a nice matte shine. 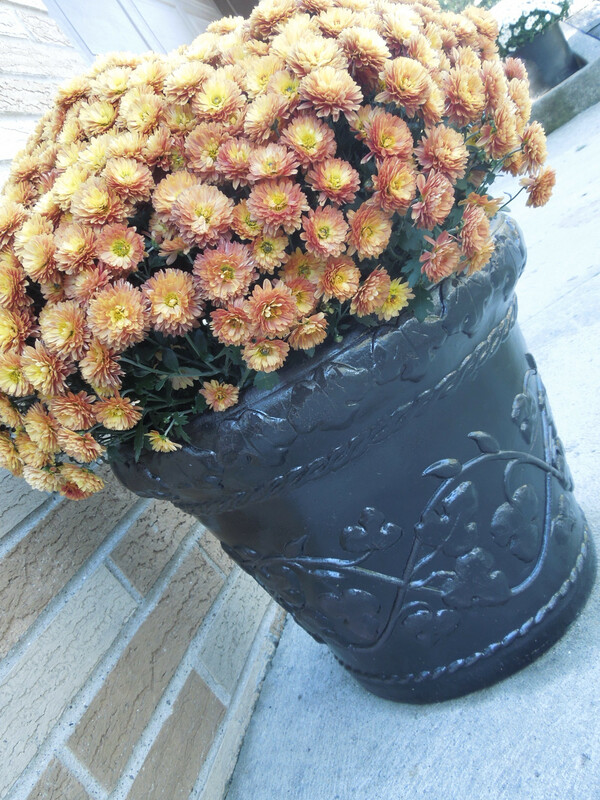 Perfect for the gorgeous burnt yellow Mums I bought from Randy’s Market in Temperance, MI. If you’re local I highly suggest you hit them up for your outdoor plants, especially hostas. Here’s Deanna’s wreath and the inspiration behind mine. She loves it by the way…I am so blessed to have a crafty accomplice who touches all of the fabric and smells all of the candles with me in a store! Makes me feel like less of a weirdo. Like I said, simple. So tell me…whatcha think? What are your go-to Autumn tips and suggestions when it comes to outdoor decor? Any fellow crafters with tips on decorating a stoop are more than welcome! kelly on Home Sweet Home!